“Nazi”: Today, over sixty years after the end of World War Two (WWII), it is probably one of the most recognizable words in the English language. But what images come to mind when reflecting upon the word? It is interesting that it isn’t the same for everyone. Historically, Nazism (National Socialism) was the philosophy and practice of the Nazi Party and of Nazi Germany leading up to WWII. It was a unique brand of fascism. Fascism is often described as a radical and authoritarian nationalist political ideology with its own economic policies. However, the Nazi Party of Germany intertwined biological racism and anti-Semitism with fascism, resulting in the Jewish Holocaust of Europe. Before the Nazi takeover of power in 1933, Europe had a dynamic and highly developed Jewish culture. In little more than a decade, most of Europe would be conquered, occupied, or annexed by Nazi Germany and most European Jews—two out of every three—would be dead. 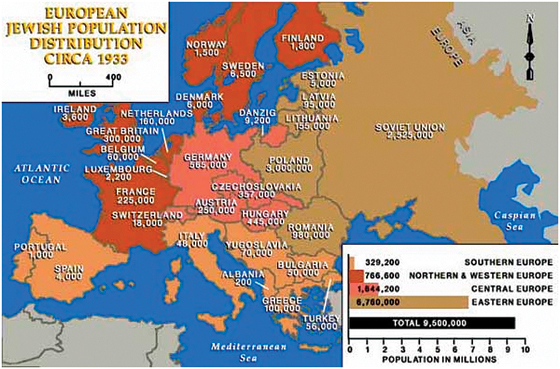 The Jewish population has not yet reached pre-Holocaust levels. World War II is still known as the deadliest war in documented history. Possibly as many as 70 million people in total were killed (the lowest estimates begin at 50 million or more people). To comprehend the impact of such numbers is staggering. To grasp the tragic manner in which many died is even more so. The causes of death ranged from actual battle mortalities to disease, starvation, or exhaustion; and, from gas chambers to complications from human scientific experimentation. Bearing that in mind, what should be associated with the word “Nazi” is their consequential slaughter of millions of people; prisoners of war and those who were deemed politically or religiously oppositional to Nazi rhetoric. These included Jews, Gypsies, Poles, Slavics, people of color, people with disabilities, and many others too numerous to enumerate. Within the popular vernacular, the word has come to represent those who are simply annoying, or who are opposed to a particular point of view. This could include people counted under any number of labels: Democrats, Republicans, Conservatives, Liberals, Feminists, Equal Rights activists; or people who are insistent on proper spelling and grammar, overly neat people, and the list goes on…. As an example, an email buddy corrects the use of a semi-colon and is promptly labeled a “grammar Nazi.” Does correcting someone’s grammar truly equate to the atrocities performed by members of the Nazi Party in WWII? This list of search returns for “Nazi” is enlightening. Millions of people suffered at the hands of the Nazis and their belief system. And yet, there are still people today who claim that the Holocaust never occurred. They espouse the Holocaust was a world-wide conspiracy. Most people will agree that this claim is a slap in the face to those, and the family members of those, who fought and died, who were imprisoned and tortured, or who were murdered at the hand of the Nazis. Some of these same people, however, may also be ready upon impulse to call their political rival a Nazi, without thought. The blatant denial of the Holocaust and the use of the word Nazi as an insult are certainly two diametrically opposite arguments. They both serve, however, to minimize the reality of the historicity of the impact of Nazism on the world. While “Holocaust denial” is widely considered a “fringe” view, and has not been taken seriously by Western society, this lie is gaining a following. On the opposite side, the “Nazi insult” found a quick inroad into Western mainstream language. This is indicative of the larger problem created by the inappropriate usage of the word. In the same way, ascribing a certain meaning to a word, in English especially, if that definition becomes widespread enough, will eventually lead to an actual change in the definition of the word. If anyone can be labeled a “Nazi,” or if any action can be called “Nazism,” the historical impact of the term becomes meaningless. When we trivialize the suffering of the people under the Nazi regime so casually, we are straying from the instruction of Ephesians 4 to use only edifying speech. And it certainly doesn’t bless Israel as prescribed in Genesis 12:3. On the opposite side, a dangerous consequence of utilizing the Nazi label is that the horrific remembrance of Nazism may be invoked into the current situation. The resulting sensationalism often brings into play an unholy fear that can some-times result in hasty and irrational decisions or actions. As Christians, we are reminded that this irrational fear is not Scriptural. Indeed, “fear not” appears in 144 verses. A relatively recent example of unfounded fear responses occurred after the Obama healthcare legislation was passed. There were instances of window-smashing in Democratic of-fices, thrown bricks, white powder mailed to representatives, threatening phone calls and faxes, and even an instance of a cut gas line. We do indeed live in the perilous times spoken of by Paul in Romans 1 and 2 Timothy 3. It is a time to ensure we speak in truth and in light the facts that educate and edify our brothers and sisters—not fall into the trap of invoking the new brand of Nazi rhetoric.